The drill you’ll see here, where three coaches initiate the action from boxes at the net, is a great example of a training exercise that emphasizes teamwork and serves multiple purposes at once. Block a cutback hit off a quick set. Defend the same hit with a digger – in this case, the setter. Transition to offense after the setter makes a dig. 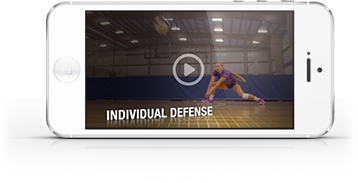 Middle blockers – Make fast and efficient moves to the left or right to defend either the “Go” or “Hut” sets. Defend a scramble ball hit deep in the court and try to get back in system for a good swing. One of Dunning’s objectives is to provide data that gives players a specific reason to get better. During this practice, an assistant logged the exact time it took from when the middles received their starting cue – the cue was the coach yelling “Hut” or “Go” – to when they got their hands over the net on the outside. This allowed players to compare their speed on the block move to the time it takes certain opponents to get the ball from the setter to the hitter.